← Betfair mobile site offers new feature, meet Price Rush. William Hill, quite possibly the biggest name in UK sports betting, recently launched an updated version of the William Hill mobile app for iOS and Android devices (in addition to a completely redesigned mobile betting website). Available for download from the App Store, this latest adaption of the already hugely popular sports betting app is compatible with devices running iOS 5 or later, and is available in English, Italian and Spanish. If you have an Android device, you’ll have to visit William Hills in order to download the app, or you can just place your bets on William Hills mobile site. 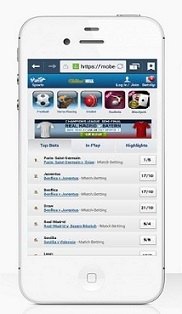 How to bet with the William Hill mobile? From the home screen of the mobile app (and on the mobile betting site from William Hill), you can quickly access a wide range of betting sites, such as William Hill’s Sportsbook, Casino, Live Casino, Vegas, Bingo and Games. While you can only bet on a limited number of markets with the William Hill mobile betting site (football, horse racing and cricket in particular), there are plenty of other great features that make up for this limited number of betting options. First and foremost is the Top Bets tab, a great feature for rookie punters that lists the most popular stakes and odds for a variety of sporting events. Add to that the In-Play betting feature and sporting news highlights, and you’ve got a well-rounded app for punters of all levels. Get your stake back as a free bet when you wager on any Live Channel 4 horse race if your horse finished in second. To cash in on these great features and bonuses, and to get the best odds guaranteed, download the app here.